The blueprint for a three-story, 15-unit brick-and-stone masonry apartment building set for 4019 N. Narragansett Ave.
CITY HALL — A plan to build a three-story, 15-unit apartment building at the Portage Park-Dunning border was approved by the City Council Zoning Committee on Monday, setting a path for construction to begin. 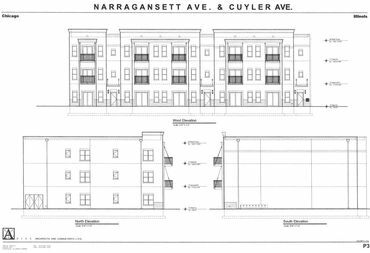 Proposed by Zitella Development, the apartments would replace Ralph Frese's Chicagoland Canoe Base shop at 4019 N. Narragansett Ave., which has been vacant since Frese died in 2012. Another developer last year had proposed filling the site with two restaurants including a drive-thru Dunkin Donuts, but officials shot down the project amid widespread complaints from neighbors over potential traffic hazards. After that, 38th Ward Ald. Nicholas Sposato reached out to Zitella and met with the site's immediate neighbors to see if new homes would be a better fit, he said. The plan drew much warmer reactions than the previous proposal, said Patricia Conroy, president of the Portage Park Neighborhood Association. After the zoning change is stamped into law by the full Council Wednesday, the site would be zoned for "mixed-use residential," despite there being no plans for retail or commercial space. The building would consist entirely of two-bedroom apartments, each with between 1,350 and 1,450 square feet of space, said Bobby Zitella, vice president of Zitella Development. Rents will start at $1,700 per month. Each apartment will have two full bathrooms, in-unit washer and dryer, a balcony, "high-end finishes" and "tons of closet space," Zitella said. The plan calls for trees, shrubs and flowers to surround the brick-and-stone masonry building. "It's a really nice project, and we're excited about it," Zitella said. "We've worked with the alderman and the community, and everyone's been very receptive, so we're excited to get it going." The stretch of Naragansett in front of the canoe shop was named for Frese, a world-renowned canoe builder and conservationist, in 2013 under a measure sponsored by former 38th Ward Ald. Tim Cullerton. When Frese's family told Cullerton they planned to sell the property, which was likely the last working blacksmith shop in Chicago, the former alderman changed the rules governing the property in an attempt to ensure nearby residents had a say in what replaced the canoe workshop and store.